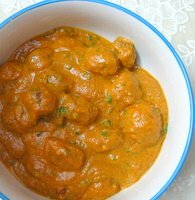 Kashmiri dum aloo recipe is made from baby potatoes cooked in a spicy gravy. Of course you can also use ordinary potatoes cut into 4-6 pieces (depending on the size) and proceed with the recipe. Enjoy the flavors of typical food from the region of Kashmir. Luckily, this recipe won't require the dum (slow cooking method) for a long time, still the taste is too good. This dish is an excellent choice for potato fans. Although onions are seldom used in typical kashmiri cooking, I have used in this recipe to enhance the overall flavor. Soak the red chilies in 1 cup hot water for 15 minutes. Then grind them with the water and ginger and garlic, to form a paste. Peel and par boil the potatoes (boil for 5 minutes in boiling water, then take out). Then prick them with a fork and deep fry on a medium flame until evenly brown. Drain on kitchen paper. Fry the sliced onions on a medium to low heat until golden brown. Please don’t put the flame on high to achieve faster result. It will burn the onions and the gravy will taste bitter. Drain on kitchen paper. Let it cool for a while. Then blend these onions along with the cashew nuts, using little water (just enough to make a thick paste). Heat 1 Tbsp oil in a pan or kadai, add the chili paste and stir fry for 2-3 minutes. Now add the onion paste and cook a little. Add the tomato puree, salt and the dry powders. Cook for 2-3 minutes. Sneak a taste if too tangy and a little sugar. Now add little boiled water (enough to make a thick gravy) and place the fried potatoes in this gravy. Gently mix, cover with a lid and simmer for 10-15 minutes without lifting the lid. To ensure it doesn’t get burned at the bottom, place your pan on a tawa or frying pan. Lastly put in a serving bowl and garnish with 2-3 julienne green chilies, chopped coriander, a few flaked almonds and 2-3 Tsp fresh cream (optional). Enjoy with hot chapati or rice!